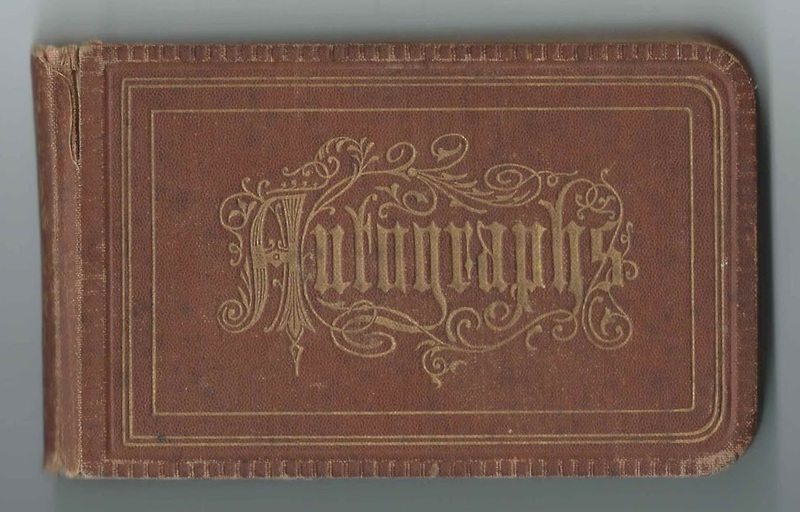 1878-1887 autograph album that belonged to Hattie Sprague, presumably of Machiasport, Maine, the residence of the majority of the well wishers who inscribed pages in her album. The album was given to her by her Aunt Ella at Christmas in 1878. 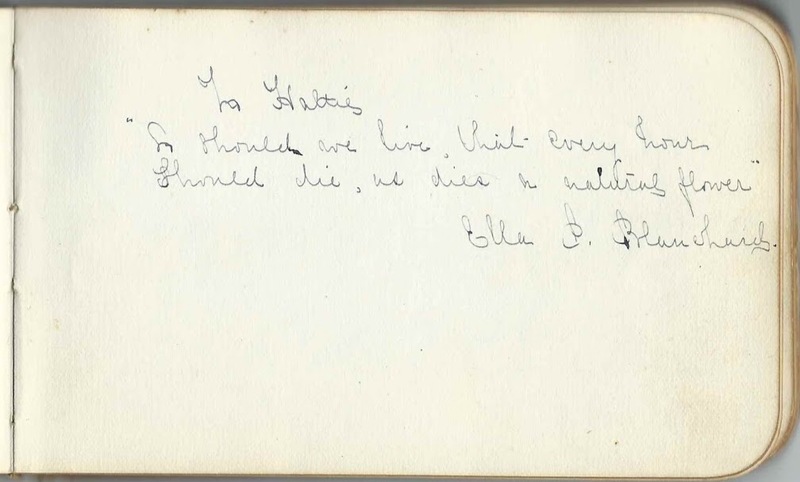 The first person to inscribe a page in the album was Ella P. Blanchard, presumably "Aunt Ella". She was Ella M. (Peterson) Blanchard, daughter of James Hewitt Blanchard and Mary Patten (Hunter) Peterson and wife of John H. Blanchard. Ella's sister Elizabeth Josephine Peterson married Francis Stephen Sprague, though there may have been an additional relationship between Hattie and Ella. 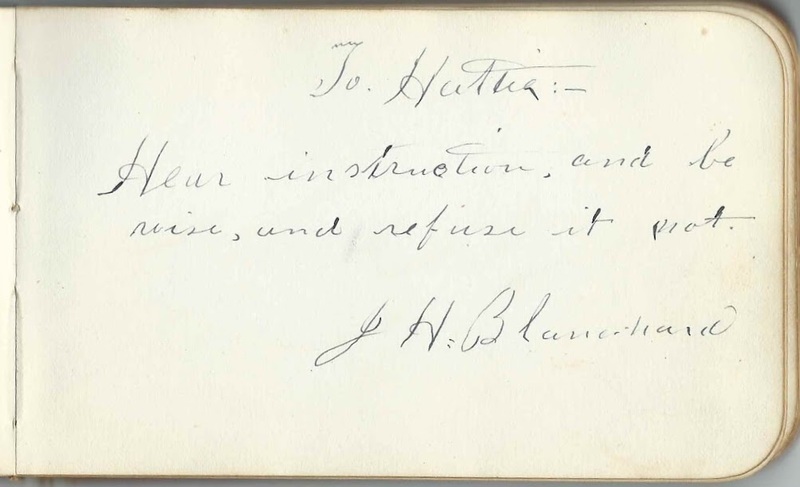 Ella's husband John H. Blanchard signed the following page. Fletcher Howard, a member of the Class of 1879 at Bates College; he signed at Machiasport, Maine on January 4, 1879. 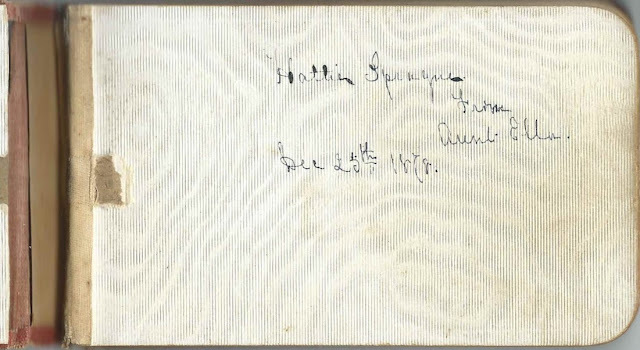 Frank A. Weed of Skowhegan, Maine, a member of the Class of 1881 at Colby College, signed a page on November 4, 1880. An alphabetical surname list and an alphabetical list of the signers, together with any personal information they offered, appear at the end of this post. I believe that the album owner was Hattie Evelyn Sprague, born at Machiasport, Maine, on June 18, 1870, the daughter of Daniel Noble Sprague and Mary Hannah (Larrabee) Sprague. Hattie would marry Edward Benjamin Ramsdell on July 12, 1890 at Machias, Maine. Edward was the son of Benjamin and Harriet Helen (Card) Ramsdell. Edward and Hattie lived at Lubec, Maine; Jefferson, Maine, and Eastport, Maine. They had, I think, nine children, two of whom died in infancy. Edward worked as a grocer, a fisherman and a farmer. Aunt Ella; gave the album to Hattie Sprague at Christmas in 1878. 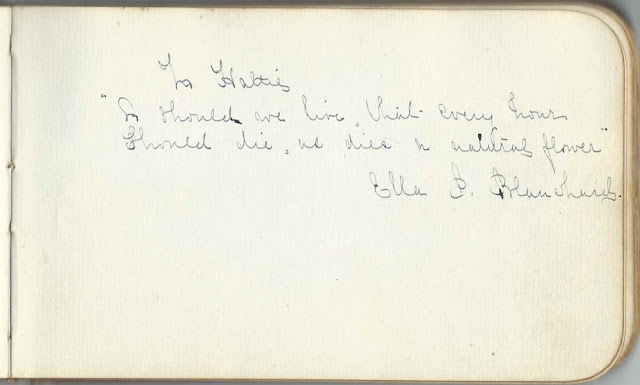 Presumably Ella M. (Peterson) Blanchard, daughter of James Hewitt Peterson and Mary Patten (Hunter) Peterson, and wife of John H. Blanchard. J. H. Blanchard; presumably John H. Blanchard, whose wife Ella M. (Peterson) Blanchard signed the previous page. Cinnie M. Crocker of Machiasport, Maine, signed on January 8, 1879. Presumably named for her mother Lucinda C. (Kenney) Crocker, wife of Jacob Crocker. Carrie Foster of Milbridge, Maine at Machiasport, Maine, on January 8, 1879. "C.F." 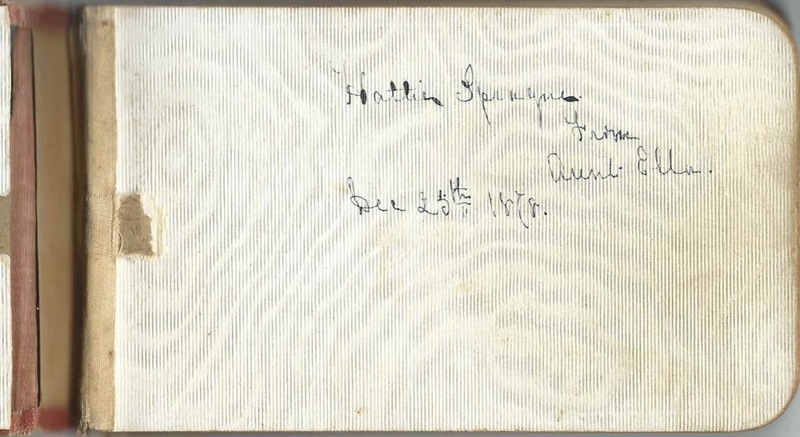 Eloise Frank of Machiasport, Maine, signed on April 4, 1880; presumably Eloise Frances Sprague, daughter of Frank Stephen Sprague and LIzzie (Peterson ?) Sprague. H. Palmer, signed at Machiasport, Maine, on March 6, 1885. Middle initial might be S or ? S. E. Sawyer of Machiasport, Maine, signed on January 9, 1880. He was Stephen E. Sawyer, whose wife Ada L. (Gates) Sawyer signed the right facing page. Ada G. Sawyer of Machiasport, Maine, signed on January 9, 1880. She was Ada L. (Gates) Sawyer, whose husband Stephen E. Sawyer signed the left facing page. Warren Sawyer of Machiasport, Maine, signed on Januaryn 10, 1879. Presumably the Warren Sawyer who was a younger brother to signer Stephen E. Sawyer. Hattie Sprague, album owner. Given the album at Christmas in 1878 by Aunt Ella. Presumably Ella M. (Peterson) Blanchard, daughter of James Hewitt Peterson and Mary Patten (Hunter) Peterson, and wife of John H. Blanchard. Sam N. Tobey of New York, signed at Machiasport, Maine, on May 31, 1880; presumably Samuel N. Tobey, son of Horatio N. Tobey and Sarah E. Tobey.